Former First Lady Nancy Reagan has been hospitalized in Los Angeles for a broken pelvis. Nancy's spokeswoman Joanne Drake says the 87-year-old former First Lady fell at her Bel Air home last week, and went for tests Monday at the Ronald Reagan UCLA Medical Center, where doctors diagnosed a fractured pelvis. Michael Reagan, Nancy's stepson, released a brief statement regarding Mrs. Reagan's hospitalization. It reads: "Our family prayers and best wishes are with my stepmother Nancy Reagan for a fast and speedy recovery." 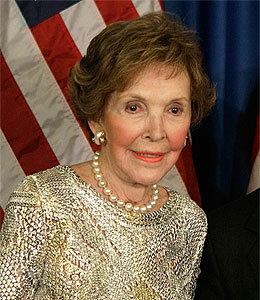 The former actress and First Lady is the widow of actor and President Ronald Reagan, who died at age 93 in 2004.